Before and After Photos 3 - The below photographs show examples of red and pink bouquets that we have preserved and framed recently. As you can see, pinks keep their colour really well and deepen only very slightly in tone after preservation. Red roses will darken to a deep red wine colour. Shower bouquet of Passion roses studded with crystal pins, Akito roses, ivory Dendrobium Orchids, Hypericum, Gypsophila, Soft Ruscus and Bere Grass. Shower bouquet of Passion roses, Vendella roses, wax flower, Hypericum, Soft Ruscus, Fern. Hand-tied bouquet of Grand Prix roses studded with crystal pins with a bere grass cage. Displayed as a birds eye view with grooms ivory Calla lily buttonhole to the side. Trailing hand-tied bouquet of Passion roses, El Toro roses and Black Baccarra roses with Hypericum, Ivy and Grasses. Displayed in front profile. Shower bouquet of Passion roses, Hypericum, Soft Ruscus and Eucalyptus with Grooms buttonhole displayed to the side. Hand-tied bouquet of Grand Prix roses, Vendella roses, Hypericum and Hard Ruscus. Teardrop bouquet of Akito roses, Old Dutch roses, white Hydrangea, ivory/pink snowberries, Ivy, Fern and assorted foliage. Hand-tied bouquet of Milano roses, pink Gerberas, pink tulips, lilac freesias, dark purple lizianthus and China Grass. Hand-tied bouquet of palest pink Cymbidium Orchids, ivory Akito roses, Hypericum, variegated foliage and hard ruscus. Shower bouquet of pink Cymbidium Orchids, ivory Cymbidium Orchids, pink carnations, ivory freesias, soft rusus (some sprayed silver) and fern. Hand-tied bouquet of Vendella roses, Old Dutch roses, pink and ivory spray roses with pearls strands entwined through flowers. Hand-tied bouquet of Sweet Avalanche roses, Avalanche roses, Mimi Eden roses, white scabiosa and jasmine. Hand-tied bouquet of Vendella roses, pink Baby Biianca roses and Pittosporum. 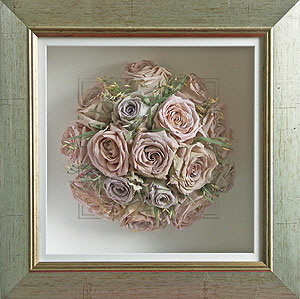 Hand-tied bouquet containing three varieties of the palest pink roses and jasmine.